Eyes are often the first thing someone notices on a person, so it would make sense that if you want to show off some body art than that’s the place to do it. Through modern technology and research scientists have found ways to create all sorts of things to change the appearance of one’s eye. Contact lenses for example now can be made so that they change the color of one’s eye and some contacts even have patterns and designs on them. For people who want the eye color change but don’t need contacts they now have eye drops which will temporarily change the color of your iris. Eyes are often the first thing someone notices on a person, so it would make sense that if you want to show off some body art than that’s the place to do it. Through modern technology and research scientists have found ways to create all sorts of things to change the appearance of one’s eye. Contact lenses for example now can be made so that they change the color of one’s eye and some contacts even have patterns and designs on them. For people who want the eye color change but don’t need contacts they now have eye drops which will temporarily change the color of your iris. Believe it or not though this is not the most extreme things people can do to their eyes. Recently a method has been discovered which allows people to not only tattoo the whites of their eyes but to also implant small metal pieces of jewelry. The process of implanting a piece of eye jewelry is called Cosmetic Extraocular Implant. “In 2002 the Netherlands Institute for Innovative Ocular Surgery developed a cosmetic extraocular implant (CEI) that can be implanted within the superficial, interpalpebral conjunctiva. The implant does not interfere with the ocular functions, ie the visual performance and motility. The CEI is made of a specially designed material that can be molded in all kinds of desired shapes and sizes” (Cosmetic Extraocular Implant). 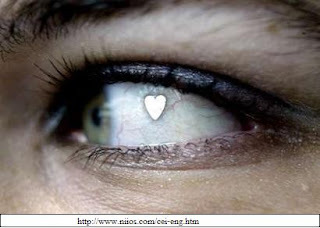 Eye tattooing “… [entails] a total of 40 injections into [the] eye to capture the proper pigment. 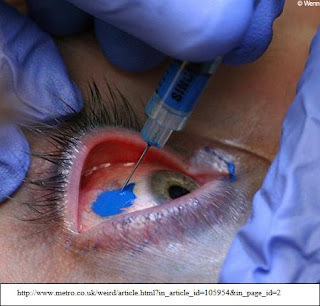 The pigment was initially injected under the top layer of the eye using a syringe… The blue ink for the tattoo was mixed with an antibiotic wash and used for the tattoo” (Eye Tattoo). These new trends just go to show how body artists are getting more and more creative and extreme. "Cosmetic Extraocular Implant." Netherlands Institute for Innovative Ocular Surgery. 30 Apr. 2009 .